Mariscos, ceviches oh my! 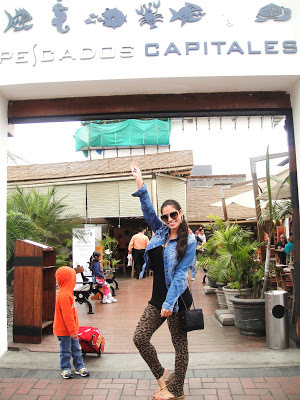 Located in the seaside Miraflores neighborhood in Lima, Pescados Capitales is a very popular restaurant famous for their ceviche and fresh seafood dishes. The entire menu is based on the 7 deadly sins, and every item on the menu has a little abstract story in it’s description. The name of this restaurant is a play on words; “pescados” means “fish” in Spanish, and “pecados” means “sins”. The menu itself is very unique and creative, and they make reading it fun and entertaining which goes hand in hand with their food too. All dishes were creative and unique and gave your idea of tradional ceviche a twist with fun ingredients and sauces! Check out what was ordered below! Instead of bread, they bring you fresh corn nuts to the table. Corn is very popular in Peru and I found they bring this out at many restaurants there before they take your order. The perfect salty snack to get your appetite going! Refreshing, light and perfect for a starter dish. The starchiness of the yellow potato added substance to the dish, and avocado just goes with a seafood tower. I’ve never had potato in a dish like this but it worked well together with the creamy shrimp and avocado. The hard boiled egg added a nice finishing touch and mixture to the dish as well. The sauce had a very cheesy flavor and mixing it with the rice was creamy, rich and delicious. They have some great sauces at Pescados Capitales! I ordered this dish. I was so glad I did. It had a citrus/garlic flavor with a spicy kick to it. I prefer a spicy and citrus ceviche over a sweet ceviche. I loved this orange chili cream sauce. It had a kick of garlic to it and it was worked amazing with the sweet potato, and fresh raw seafood. My favorite was the sweet potato and the tuna. Sweet potato gave this ceviche the perfect unigue twist from your traditional ceviche. This is one of their most signature ceviches at Pescados Capitales, and I definitely recommend it. This was a sweet ceviche. The sauce was light with the flavor of tropical fruit and curry which is a very interesting combo to the taste buds lol. I wouldn’t say I didn’t like it, but it was different and I think I might prefer a salty/citrus ceviche. Pescados Capitales was such a cute restaurant. You can sit either indoors or outdoors, but expect to wait if you don’t have a reservation. It’s supposedly always busy and hard to get into. All the dishes had creative, unique presentations and their seafood is fresh out the sea which is just a couple blocks away 🙂 Lima is known for their cevicherias, and this place is on top! So when in Lima…get your ceviche on! ENJOYING THE DAY SIGHTSEEING IN LIMA…AT PLAZA DE ARMAS!